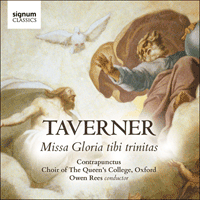 Owen Rees conducts a programme centred on John Taverner's expansive Missa Gloria tibi Trinitas. Performances from early-music specialists Contrapunctus are convincingly bolstered by the voices of Queen's College Choir Oxford in this most arresting of recordings. We do not know when or for what institution John Taverner wrote what is perhaps his finest work, the Missa Gloria tibi Trinitas. The two choral establishments with which he is most securely associated as a professional musician were both dedicated to the Holy Trinity, and are therefore both good candidates. The first of these is the great collegiate church in Tattershall, Lincolnshire, where Taverner was a singer in the mid 1520s (and possibly for some time before this); the second is the prodigious new collegiate foundation in Oxford, Cardinal College (now Christ Church and Oxford Cathedral), of which the foundation stone was laid in 1525. The College was the creation of Cardinal Thomas Wolsey, Archbishop of York and Chancellor of England, and the most powerful man in the country after the king. He created it on a scale that was intended to outstrip all previous collegiate foundations in grandeur: the new chapel (the construction of which had hardly begun at the time of Wolsey’s fall) was meant to rival that of King’s College Cambridge. Taverner was appointed as the first master of the choristers of the College in 1526, but his tenure—he worked in the old Augustinian Priory church, taken over for the college and not yet demolished, and in the midst of a vast building site—was very brief: after Wolsey’s fall from royal favour in 1529 (after which his college and its choir went into decline) and the Cardinal’s death in 1530 Taverner returned to Lincolnshire, and lived in Boston for the rest of his life, during which period he acted as a local agent of Thomas Cromwell, Henry VIII’s chief minister. Both Tattershall and Cardinal College had choirs of considerable size: at Tattershall the establishment in the early sixteenth century included ten lay clerks and ten choristers in addition to the chaplains, while that at Wolsey’s Cardinal College was larger still, with twelve lay clerks and sixteen choristers besides the twelve or thirteen chaplains. It seems likely—given Taverner’s position at Cardinal College—that such major works as the Missa Gloria tibi Trinitas also entered the repertory of Wolsey’s own household chapel choir, which surpassed even the Chapel Royal choir. In the 1510s it was reported that Henry considered Wolsey’s household chapel superior to his own, and that when new repertory was placed in front of the singers of these two choirs, it was ‘better and more surely handled’ by Wolsey’s singers. The numbers of men (‘gentlemen’) in the Chapel Royal ranged between 20 and 32 during Henry’s reign, and the numbers of boys between 8 and 12. While at many services featuring polyphonic music not all the gentlemen would have been present, on major feasts such as Trinity Sunday it seems likely that the full forces were deployed, i.e. some 30 or 40 singers, similar numbers to those we use on this recording. Taverner’s Mass might well have been heard on Trinity Sunday in the chapel of Wolsey’s palace at Hampton Court (taken over by the King after Wolsey’s fall), or in the various palace chapels used by the monarch. The Missa Gloria tibi Trinitas takes pride of place in the Forrest-Heyther partbooks (in the Bodleian Library in Oxford), and it has been variously argued that these originated at Cardinal College or at the Chapel Royal. Robert Phillips was so notable a singing man (wherein he gloryed) that wheresoeuer he came, the best and longest song, with most counteruerses in it, shuld be set vp at his commyng. And so his chaunce beyng now to be at Windsore, agaynst hys comming to the Antheme, a long song was set vp, called Lauda viui. In which song there was one counteruerse toward the end, that began on this wise, O redemptrix & saluatrix. Which verse of all other, Robert Phillips woulde sing, because he knew that Testwood could not abide that dittie. Now Testwood knowing his mynd well enough, ioyned with him at the other part: and when he heard Robert Phillips begin to fetch his flourish with O redemptrix & saluatrix: repeating the same one in anothers neck. Testwood was as quicke on the other side to answer hym agayne with Non redemptrix, nec saluatrix, and so striuyng there with O and Non, who should haue the maistrie, they made an ende of the verse. These contrasts between fully scored and solo sections provide opportunities for drama which are strikingly exploited in works such as the Missa Gloria tibi Trinitas (where the fully scored sections are for six parts) and Taverner’s votive antiphon Gaude plurimum which opens this album. Such drama is apparent, for example, at the first full entry of Taverner’s Gloria, at ‘gratias agimus tibi’. On this recording, the solo sections are performed by the members of Contrapunctus, and the full sections by all the voices (Contrapunctus and Queen’s Choir). The melodic and rhythmic writing in the Missa Gloria tibi Trinitas is often virtuosic—especially at moments of climax such as the energetic rising scales setting ‘Amen’ at the end of the Gloria—but there is a remarkable degree of variety within the work, and among the sections for reduced numbers of voices one finds passages of striking expressive simplicity, such as the famous ‘In nomine’ in the Benedictus, and also the four-voice ‘miserere nobis’ in the second Agnus Dei. The Mass takes its title from the plainchant upon which it is based, a melody which is heard repeatedly during the course of the piece, mainly in the fully-scored sections, laid out as a long-note cantus firmus in a single voice-part. The chant is speeded up for the climactic closing sections of the Credo (‘Et exspecto …’) and Agnus Dei (‘Dona nobis pacem’). This chant melody was to become the basis for a whole repertory of textless pieces, ‘In nomines’, which had its origins in the setting of ‘In nomine Domini’ in Taverner’s Mass, where the chant—beginning with a rise and fall of a third—can be clearly heard in the mean (that is, the second-highest voice). The scorings employed by Taverner in the Mass range from duets to rich and motivically dense writing for all six voices, and there is a kaleidoscopic variety of vocal combinations, including the striking ‘gapped’ texture of treble and bass: in the ‘Crucifixus’ section of the Credo two trebles engage in a ‘gimel’ dialogue supported by a bass. The recording opens with one of Taverner’s most widely copied works, Gaude plurimum. Here again an essential feature is the alternation of solo sections and fully scored passages, and again the entrances of the full choir are dramatic. Taverner positions the second of these entrances appropriately at the communal invitation to rejoice: ‘gaudemus igitur’, while the third, at ‘assequi non valemus’, interrupts the soloists part-way through a sentence. In the opening fully-scored section Taverner exploits the power of his full forces to evoke Christ’s harrowing of hell and the breaking of ‘the bloody powers of the prince of eternal death’. Some of the scoring-shifts within the solo sections of the work likewise serve to highlight meaning: the opening extended duet of mean and tenor is suddenly joined by the bass at the words ‘true God’. We precede the movements of the Missa Gloria tibi Trinitas with the four-voice Le roy Kyrie, sung by Contrapunctus. This Kyrie was probably intended for use at the Lady Mass (in honour of the Blessed Virgin Mary), most likely on a Sunday. The setting is, like the Missa Gloria tibi Trinitas, based on a pre-existent melody (here sung by the top voice), but in this case the melody is not plainchant, but a so-called ‘square’ (a melody in measured rhythm originating in an older polyphonic work) which bears the name ‘le roy’ (‘the king’). It has been suggested that Taverner’s setting was composed in honour of Henry VIII. 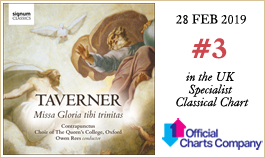 Taverner’s Ave Maria is likely to be one of the works written while he was at Cardinal College, Oxford, and indeed it may have been among his most frequently performed pieces during those years. In Cardinal Wolsey’s amendments to his original statutes for the College he specified that during the daily evening devotions ‘Ave Maria’ was to be sung solemnly, with all genuflecting, and that a bell was to be rung three times during the singing of this antiphon. Taverner duly left three pauses in his setting to allow for the bell to be rung, and he manipulated the handling of the text to highlight these points, beginning all three opening polyphonic segments with the word ‘Ave’: his opening polyphonic phrase sets only this word, the second adds ‘Maria’, and the third sets the initial word of salutation to simple chords with pause marks (perhaps to allow for the singers’ genuflexion) before proceeding with ‘gratia plena …’. Only three of the five voice-parts of Taverner’s setting survive, and here we record my own reconstruction, which is based in part on the previous completions by Hugh Benham and Nick Sandon. The final two works on the recording, Audivi vocem and Dum transisset Sabbatum, exemplify different aspects of Taverner’s music for the Hours of the Divine Office, and specifically the Night Office of Matins, and they reveal very different sound-worlds. They were composed to be performed on two of the greatest feast days of the year, All Saints’ Day (in the case of Audivi vocem) and Easter Day (in the case of Dum transisset Sabbatum). In a different way to Gaude plurimum and the Missa Gloria tibi Trinitas these two works—which belong respectively to the genres of ‘solo responsory’ and ‘choral responsory’—reveal the contrasts between polyphony sung by soloists and by the whole choir. When sung in an all-plainchant performance, the opening word and the central verse of Audivi vocem were sung by five boys carrying candles and facing the altar, while the remainder of the ‘respond’ section (beginning at ‘vocem’) was chanted by all the other singers and clergy from their places in the quire. Taverner may have intended his (four-voice) setting of just the soloists’ sections of this responsory to be sung by the appropriate forces of five boys, with two of them doubling the vocal line which has the plainchant. The interweaving of these four closely-spaced high voice parts in polyphony produces an extraordinary effect, not least in the passage towards the end of the verse (at ‘veniet’) where the rhythmic pace increases and the voices engage in an almost frenetic quick-fire dialogue. Just before this, Taverner draws attention through simple chordal writing to the moment—at the word ‘Ecce’ (‘Behold’)—where the singers turned round to face the choir and announce the coming of the Bridegroom (Christ), and we have sought to reproduce the effect of this liturgical action on the recording. As would have occurred in performances of this responsory in Taverner’s time, the small forces singing the polyphony are juxtaposed with the large body of singers taking the intervening sections of plainchant. The final piece on the album—Dum transisset Sabbatum—is a ‘choral’ responsory (a polyphonic genre of which Taverner seems to have been a pioneer), with polyphony provided for those sections of the chant that would have been performed by all those in quire, and the soloists’ chant (the opening two words, the verse, and the doxology) sung by soloists. As became standard in such choral responsories in England, Taverner weaves his polyphony around the steady tread of the plainchant, laid out in equal-length notes (here in the tenor part), and the repetitions inherent in the responsory form bring us back repeatedly to the word that marks the triumph of Easter Morning after its absence from the liturgies of Lent and Holy Week: ‘Alleluia’.